Properties in Vieirao Stadium average 4.4 out of 5 stars. Feel like you are home, sinta se em casa! Property 5: Feel like you are home, sinta se em casa! Property 8: Z-Sul CAVALHADA - High Standard 2d 1 seat 100% air-conditioned Q / F - Barra Shopping. Property 20: Apt 2 bed + dep. 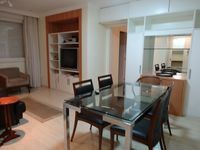 110m2, Led Tv, Ar, well furnished, Class A.
Ap 30m individual ground floor in front of Shopping Center Home. Property 27: Ap 30m individual ground floor in front of Shopping Center Home. Property 32: Double room in house next to Barra Shopping Sul. 303 - Beautiful apartment, modern and well located! Property 35: 303 - Beautiful apartment, modern and well located! LOFT A, in the coverage with all services and structure of Flat Poa. Property 38: LOFT A, in the coverage with all services and structure of Flat Poa. LOFT 03, ground floor with all services and structure of Flat Poa. Property 39: LOFT 03, ground floor with all services and structure of Flat Poa. LOFT E, on the roof with balcony with all services and structure of Flat Poa. Property 40: LOFT E, on the roof with balcony with all services and structure of Flat Poa. APARTMENT 201 D - of 1 bedr. furnished w / maid, laundry, NETTV and internet. Property 41: APARTMENT 201 D - of 1 bedr. furnished w / maid, laundry, NETTV and internet. Property 42: APARTMENT 201 C - of 1 bedr. furnished w / maid, laundry, NETTV and internet. The apartment is a beauty, well equipped and close to everything. The owner is very accommodating and helped us feel at home. Special note: we left behind some Canadian currency, their maid found it and he offered to send the money back to us. It would probably take a while for us to miss the money (if so; it was not that much) but Frederico connected with us right away. Great customer service! We recommend this place and will rent it again. We had a perfect experience staying here in Porto Alegre. First, Milton was an unbelievable host. He was one of the nicest people I have ever met. He was incredibly responsive to emails before the trip and he met us very late at night after our flight arrived to give us the keys and get us settled. Milton lives in Gramado a few hours from Porto Alegre. We visited for a day and he took several hours to drive us to places and show us around his city. I can not say enough about how amazing he was. The apartment in Porto Alegre was fantastic. It could not be in a better location. Rua Lima e Silva is the main street in Cidade Baixa which I think is the best neighborhood in the city. The street is filled with awesome bars and restaurants. And it is only 1 block from the grocery store which was very convenient. Even though there is so much happening on the street, the apartment was still nice and quiet. The building has 24 hour security and a garage if you need it and the doormen were very helpful. Everything was incredibly clean. The apartment has as bedroom with a full size bed and Milton got us two twin sized beds in the living room as we had 4 people. The kitchen and bathroom are also nice. As shown in the pictures, upstairs there is a nice Cinema which we used to watch soccer games. There is also a fitness facility which was awesome to use to work out. The pool is quite beautiful, though we were there in the winter so it was a bit cold. It is on the roof which has some incredible views of the city! Overall, I highly recommend staying here! The location, security, and cleanliness of the apartment combined with an amazing host make this a PERFECT SPOT. Thank you again Milton!